Zebronics is a technology company that manufactures basic tech equipment such as IT peripherals, LED TVs, multimedia speakers, air coolers, accessories, etc. This tech industry also has another production chain which majors on tablets. 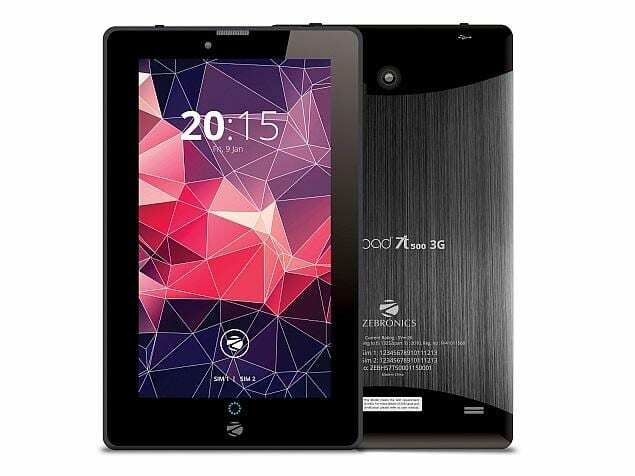 The Zebronics Zebpad 7T500 is a product of the Zebronics tablets chain. Zebronics Zebpad 7T500 is a budget tablet with a fantastic design that gives it off as endearing. While we’re still on the Zebpad 7T500 tablet, let’s briefly take a look at the tablet’s key specifications. The tablet’s design as I said earlier gives it off as endearing. The frontal outlook portrays a clean, sharp display with the Zebronics flashy “Z” logo appearing at the bottom bezel. The top bezel houses the front camera and the microphone. The rear has its upper and lower portions having a smooth black coloured design while the portion in between sports a grey-coloured design. The volume keys and the power button appears on the right hand side of the tablet. The top of the tablet is home to the USB port and the audio jack. The tablet has the dimension 188mm x 108mm x 11mm. It has a light weight of 280g. The tablet comes in a black coloured design. The tablet has a screen display size of 7.0 inches. That’s the minimum height requirement for a tablet though. Anything less than that will zone it into the phablet region. The screen display type is the capacitive touch screen type. The screen resolution of the tablet is 600 x 1024 pixels, a meagre screen display resolution. The display has a 16:9 aspect ratio. The screen display lacks screen protection. The tablet has 16M colours. The primary camera of the tablet which is located at the rear sports a 5MP shooter that handles the capturing of images. A LED flash is also made available for the brightening of images in low light conditions. Some of the features of the primary camera are touch focus and interpolation. The front camera sports a 2MP lens for capturing selfies. Of a truth, the selfie camera quality is low thereby relegating the tablet to a poor selfie tablet. The tablet runs on the Android OS. Its processor build is the Dual core Cortex A-7. The CPU clocks at a speed of 1.2GHz. The graphics processor is the Mali400-MP1. The internal storage of the tablet has an 8GB capacity. This takes care of the storage of files and documents. The storage capacity can be extended up to 32GB with the use of a micro SD card. For the running of apps and multi-tasking, the tablet uses a low 1GB RAM. The RAM type is the DDR3. The tablet uses a non-removable 2,800mAh Lithium Polymer battery. The price of Zebronics Zebpad 7T500 is US $82.